ESG (environmental-social-governance) investing involves investing in companies that provide positive leadership in areas that are material to improving societal outcomes. Some areas of impact include:  Climate change  Sustainability  Diversity  Human rights  Corporate governance. When dealing with investments, it is impossible to predict the financial markets, however, you can determine the causes that your investments are contributing to. Please join Mary Jane Maniscalli and Jennifer Leong of Wells Fargo Advisors and Scott Mackey of Calvert Investments to learn more about how you can invest in the causes that you value the most and the types of investment vehicles that can help you do so. 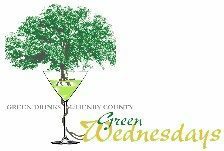 On the first Wednesday of each month, environmentally-minded people gather to network and talk about sustainable programs and “greening” the future. Everyone is welcome to attend. Green Drinks McHenry County is organized by an independent Green Drinks Committee made up of volunteers and is co-sponsored by the Environmental Defenders of McHenry County and Duke’s Alehouse and Kitchen.